The Email Settings can be accessed by clicking the Email Settings tab within Setup. Email Settings can be configured to use with any email server that accepts mail relays. The Email Settings allow CAKE to communicate with your specific email Server for the purpose of sending emails like newsletters and alerts from CAKE. Email Templates can be found from the Email Templates sub tab of Setup. CAKE provides default Email Templates that are automatically sent for various actions, such as the Login Info template. You can tell which are default templates because there are limited choices in the Action column on the right and they CANNOT be deleted. The screenshot above illustrates the difference between default and custom templates. HTML emails instead of plain-text emails. To add a new Email Template, click on the "Add Email Template" button in the top-right corner. This will open the Email Template wizard. Once you've named the new template, click Next. The next step will be a summary page asking for confirmation. Once verified, click Finish to open the Email Template card. HTML template, don't forget to check the "HTML" checkbox in the upper-right above the token list. Certain values can be tokenized and to assist you, the list of available tokens is listed on the right-hand side. Also above the Tokens list is the option to attach files from your computer. To see what your template will look like, you can click on the "Send Test to Me" icon from the Email Templates grid, this will send a proof to your email address that you are logged in with. Additionally, you can schedule a delivery or remove a template by using the icons on the right of the grid. We also have an unsubscribe link so that your contacts can unsubscribe from future system-generated emails. Below are samples of unsubscribe information that you can include in your email templates. There are 2 samples to accommodate whether your email template is in plain text or HTML. To unsubscribe from future emails, please click on the following link and enter your email address. To unsubscribe from future emails, please click <a href="http://YOURADMINDOMAIN.com/unsubscribe.aspx">here</a> and enter your email address. When a user unsubscribes through this link, it will uncheck the "Include in Mass Emails" checkbox located on his/her contact card, preventing them from being included in future system-generated emails. To send emails, hover over the Setup main tab, go down to Deliver Email, then over to the recipients you would like to mail to. You can choose from all contacts, Affiliates, Advertisers, and Buyer and List Managers if you have licensed the Lead Gen license of CAKE. The Email Delivery Wizard allows you to select filters to narrow down the recipients who should receive your email. Depending on who you are mailing to, the filters will vary. 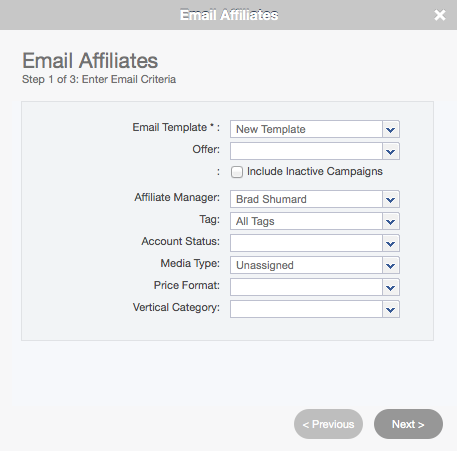 The Email Affiliates wizard shown above includes the most filter options. Every filter you select will be applied together. For example, if you selected the all three of the filters below, your email will only be sent to Affiliate contacts who meet all three criteria. If NO filters are selected, the system will find all contacts with valid email addresses. Your selected filters will be displayed in the second step for review along with the total number of contacts that the system found that met that criteria. If everything is correct, click FINISH and your email will be sent. If Affiliates would like to "opt-out" from emails sent via CAKE, they can do so on the info tab of their contact card. How Do I Make Money using CAKE Basic?